Veteran ISKCON filmmakers fulfill their desire to introduce Srila Prabhupada to audiences around the world. I was in Houston, Texas, for the premiere screening of the Hare Krishna! film, and during the question-and-answer session after the screening, an elderly woman in the front row raised her hand. I called on her. "For many years now," she said, "I've had a dream I wanted to fulfill, but I kept telling myself that I was too old, that such dreams were meant for people half my age or less. But after seeing your film and what Srila Prabhupada did at such an advanced age, now I realize that I'm not too old. That I can also try to fulfill my dream and, with God's mercy, maybe I will have a tiny bit of the success that Prabhupada had." In March of 1974 my husband, Yadubara Dasa, said to Srila Prabhupada, "We would like to make a film about your life." 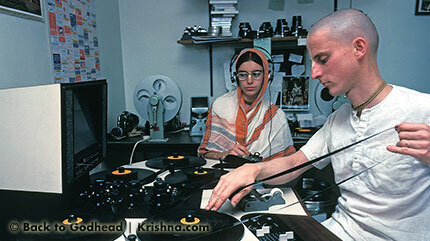 Yadubara and I had just released the first documentary film on the Hare Krishna movement, The Hare Krishna People. We'd premiered that film in Mayapur, West Bengal, during Gaura Purnima, the full-moon festival in honor of the anniversary of the appearance of Sri Chaitanya Mahaprabhu, and devotees from around the world were enthusiastic to screen the film in their temples and in other places when they traveled to spread Krishna consciousness. Thinking of our next project, Yadubara had approached Srila Prabhupada. Prabhupada considered the question and said, "What is the need?" "Since devotees are now chanting the maha-mantra on the streets of major cities everywhere," Yadubara replied, "many people throughout the world have heard of Hare Krishna. But very few people have heard of you, the person who founded the Hare Krishna movement in the West. We feel it's important for people to know the person behind the movement." Again Prabhupada considered. Then with a casual left-to-right movement of his head, he said, "Yes, then it is all right." Yadubara and I had made The Hare Krishna People film under the banner of ISKCON Cinema, an entity established to produce films on the Hare Krishna movement. As the ISKCON Cinema team, Yadubara and I went on to make other films: The Spiritual Frontier, Brilliant as the Sun, A Spark of Life, The Golden Avatar, Vrindavan: Land of Krishna, The World of Hare Krishna, and Your Ever Well-Wisher. We also produced an eleven-part chronological DVD series that contained all the known footage of Srila Prabhupada along with commentary by his followers and acquaintances. Then in 2013, Hari Sauri Dasa, who was organizing the museum exhibitions in the upcoming Temple of the Vedic Planetarium (TOVP) in Mayapur, suggested that we make a documentary on the life of Srila Prabhupada for screening in the large, modern TOVP theatre. So we began Hare Krishna! The Mantra, the Movement, and the Swami who started it all. We thought this film would take two years to complete – twice as long as any of our other films – but Hare Krishna! turned into a four-year project. We thought our initial budget was reasonable and covered all our projected expenses, but the actual cost of Hare Krishna! was twice our estimate. Not having previously made a film for public release, we needed a larger crew, and as word spread of the project, one by one they came. Help first came in the form of Coralie Tapper from Australia. She did the bureaucratic groundwork for our new, nonprofit production company, Inner Voice Productions, Inc. Her sister, Hladini Radha Devi Dasi, offered her talents as an editor, and in the backyard of our production house in Alachua, Florida, Hladini's husband, Krishna Murari Dasa, created an excellent set of Srila Prabhupada's cabin aboard the Jaladuta cargo ship that carried him from India to the United States. Other dedicated, talented, and enthusiastic young people joined us: Krishna Sakti Dasa, a film editor from Los Angeles; Lalita Priya Devi Dasi, a producer/director from Sydney; and Lalita Priya's cousin Jessica Heinrich, also a producer and also from Sydney. In our production house near the New Raman Reti temple community, our small team struggled. One of our biggest challenges was the mountain of material we had to work with: 31 hours of footage of Srila Prabhupada, archival footage of India from the 1900s showing the culture and events that Srila Prabhupada lived in and through, archival footage from the 1960s and '70s of the U.S. when Srila Prabhupada arrived, 90 hours of interviews with followers and scholars who knew Prabhupada and his movement, 20,000 photographs of Srila Prabhupada and his followers, reenactments of Srila Prabhupada's childhood and meeting his spiritual master, reenactments of his 1967 health crisis, plus 1,800 hours of audio – lectures and conversations of Srila Prabhupada. Where to start and what to use? From the beginning our vision for Hare Krishna! was that Srila Prabhupada would tell his own story in his own words. Making that a reality, though, was difficult. Prabhupada almost always spoke about different aspects of the philosophy of Krishna consciousness, but once in a while, on rare occasions, he would relate what it was like to be alone in New York City at age seventy with no steady source of income, no supporters, and no friends; what it was like for him when everything he had of value was stolen from the Manhattan office space he was renting; how he started the first temple at 26 Second Avenue in Manhattan, and so forth. These sentences were gems for us, and we strung them together so that as far as possible Srila Prabhupada tells his own story in his film. He also occasionally explains the basic tenets of Krishna consciousness and even jokes with a reporter. We worked with this audio and visual material for two and a half years and came up with a two-hour, twenty-minute rough edit. And we were stuck. We needed to cut out fifty minutes but no longer knew what to include and what to exclude. We were attached to it all. Then, through a friend of a friend, we met Peter Rader and Paola di Florio, Hollywood documentary filmmakers, who saw our rough cut and, although they hadn't previously heard of Prabhupada, became captivated by his message, his personality, and especially his story. With the help of their fresh and expert input, we were able to work steadily forward, making major and minor adjustments to the film. Peter and Paola also offered us all their contacts for both film production and distribution, which in the end proved most valuable. In September 2016 we held a test screening of our now ninety-minute film in Gainesville, Florida, inviting seventy newcomers to see the film and give written and spoken feedback. We also had another test screening with a small group of devotees from the Alachua, Florida, community where we were based. As a result of all this input, the film's title changed from Acharya (hardly anyone knows what it means) to Hare Krishna! (which is famous) and got further insights into how to shape the film. 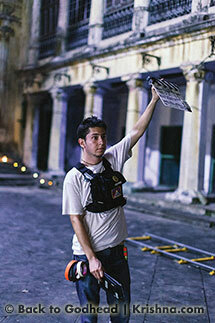 One contact from Peter and Paola was Richard Abramowitz, head of Abramorama, a film distribution and marketing company. After seeing the film, Richard wrote, "We think your film is terrific: consistently smart and interesting. We're certain there's an audience for it." And indeed there was. Richard was enthusiastic to represent our film to cinema houses throughout the U.S. and Canada, and we signed a contract engaging not only Abramorama but also their partner PR company, Falco Ink, which has represented such Academy Award winners as Gladiator and American Beauty. We also submitted the film to the 2017 Illuminate Film Festival, the world's premiere festival for "conscious cinema," held annually in Sedona, Arizona. To our surprise and by Krishna's grace, on June 4 Hare Krishna! won the Jury Prize for best film of the festival. The world public premiere in New York City was on June 16, 2017, before a full house in the Village East Cinema, just blocks from the first Hare Krishna temple at 26 Second Avenue. The Los Angeles premiere followed, and in both cities the weeklong screenings were extended. Then Hare Krishna! traveled to 36 North American cities (346 screenings), Moscow (premiering on Srila Prabhupada's appearance day), India (50 cities and 700 screenings), South Africa, Botswana, Mauritius, Bahrain, Holland, the United Kingdom, and other countries throughout the world. Lilananda Dasa, our marketing director for Latin America, with the help of a team of devotees, organized screenings in 136 cities. Although Hare Krishna! received some favorable comments from professional film reviewers, overall their reviews were not anywhere near as favorable as the responses from the public – members of the audience – many of whom were previously unfamiliar with Prabhupada, his teachings, and his mission. Vishakha (pronounced Vi-shA-khA) Devi Dasi received an Associate of Applied Science degree with honors from Rochester Institute of Technology and shortly afterwards published her first book, Photomacrography: Art and Techniques. In 1971 she traveled to India, where she met His Divine Grace A. C. Bhaktivedanta Swami Prabhupada, read his Bhagavad-gita As It Is, and eventually became his student. She traveled with and photographed Bhaktivedanta Swami and his students in India, Europe, and the United States. In 2013, when I received a request from Hari Sauri Prabhu to make a film on the life of Srila Prabhupada for visitors to the TOVP [Temple of the Vedic Planetarium in Mayapur, West Bengal], I was hesitant. Knowing the challenges, I thought, "Let's just use the previous film Your Ever Well-Wisher." But that was made over thirty years ago and for a devotional audience. I soon realized we need a film for the public. The next four years was decision after decision – thousands of decisions – to come up with the final movie. As the director, I had to make choices, sometimes against the judgment of the crew but more often agreed upon with delight and in line with our individual and combined inspirations. It was moving to witness the crew – absorbed in Srila Prabhupada's pastimes – coming closer to him. Along the way there were many "Krishna magic" moments that none of us could have arranged or predicted. Traveling with the film for a year to over one hundred screenings and premieres around the world and seeing the transformation in the hearts and minds of many who didn't know anything about Srila Prabhupada and his ISKCON movement has been inspiring beyond words. 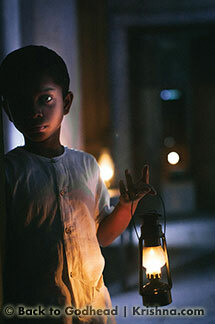 For many, the film has crossed all racial and religious barriers. And for devotees, viewing the film has evoked a sense of pride in their connection with Srila Prabhupada and increased their desire to serve and become more serious in trying to follow his instructions. All in all, the impact of Hare Krishna! has been more than any of us ever imagined. What is so powerful about this film is that you are directly hearing from Srila Prabhupada his incredible life story in a unique way that we haven't seen before. This, combined with seeing him on the screen in such living color and hearing from those who were close to him, provides the viewer with a profoundly intimate experience in getting to know Prabhupada and forging a personal relationship with him. You can't help but be moved by his presence before you on the screen. This was my experience in helping to make the film. Prabhupada transformed from being a somewhat distant figurehead into being a living, breathing, dynamic, well-wishing, compassionate force and friend in my life. Making the film was about helping to provide an opportunity for others to experience this intimacy with him, an opportunity that could not be possible without the dedication of Yadubara and Vishakha Prabhus. They have made it their life's work to capture Prabhupada in stills and on film, and it is by their legacy that new generations will come to feel as if they themselves walked alongside Prabhupada when he was physically present, hanging on his every word or waiting for him to arrive off the next airplane. It is by their sacrifice and dedication that Prabhupada's story is preserved and accessible to all in this way for many years to come, and I feel grateful and indebted to them. Being a part of the Hare Krishna! 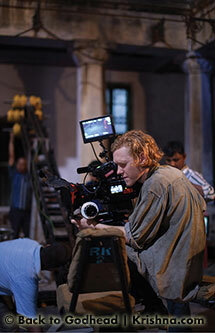 film team has been a life-changing experience for me, not only regarding my career, but also on a much deeper level. 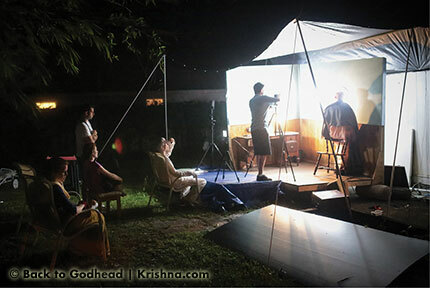 Through the process of making the film about the inspirational life of Srila Prabhupada and the history of the bhakti-yoga practice in the West, I realized how important it is to prioritize leading a balanced and conscious life where I take time for self-exploration, to connect with other people on a deeper level, and to be more aware of my choices and their impact on the world around me. To be able to share Prabhupada's story with thousands of people around the world and to see the uplifting quality it has on audiences, regardless of their own spiritual beliefs, is very gratifying.